Blood, death, destruction, Goths, doom metal: all themes you won't find in NetEnt's video slot, Flowers. 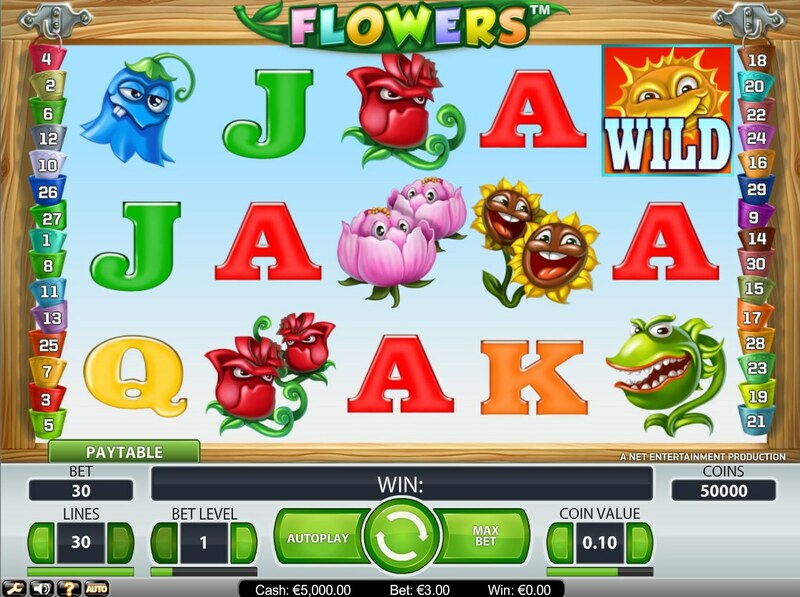 Yes, this 5-reel, 30-payline slot from the leading developers is all about summer, bright sunshine, and a few more flowers just for good measure. 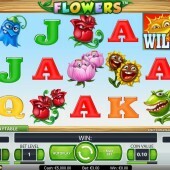 For a slot called Flowers, you'd expect the reels to be full of tulips, sunflowers, bluebells and roses. So it's great to see that the reels are full of tulips, sunflower, bluebells and roses. Each one has been anthropomorphized a little, with smiles and frowns abound. Look out too for the double flower symbols, as they're the game's coolest feature. If they appear on the reels they count double towards your total if forming a winning combo. That's great if you hit, say, two double bluebells in a combo with a single bluebell, making in total a 5-bluebell win - that would bag you the jackpot! Filling out the reels are the familiar 10-through-Ace symbols. The Wild is represented by the Sun, which substitutes for all symbols other than the Scatter, in this case the Clouds symbol. You'll need four or more Clouds to trigger a free spins round, but remember that double symbols count towards your four, so you could find that the free spins are fairly regular. Free spins wins are trebled, and you can win anything from 10 to 30. Not only that, extra Wilds appear during the free spins. If you're after some summer fun, there's plenty out there to enjoy. Freaky Fruits, the classic summer-themed slot from CTXM, offers some respite from the winter gloom, while you can never go wrong with the progressive jackpot-loaded, fruit-fueled mayhem of Microgaming's Big Kahuna. As for Flowers, if it weren't for the attractive free spins and use of double symbols, there wouldn’t be much to recommend here. Luckily for NetEnt, there is.